Hope's Cafe: Blue Cotton Custom T-Shirts $100.00 Gift Code Giveaway!! Blue Cotton Custom T-Shirts $100.00 Gift Code Giveaway!! Hey everyone, I'm back!! I had a great time on vacation, and I'm glad to be back blogging-especially with such a great company and great giveaway for you all! Remember a couple weeks ago I posted a review of some custom t-shirts I had printed through Blue Cotton? I was very pleased with the shirts, and they all still look great. 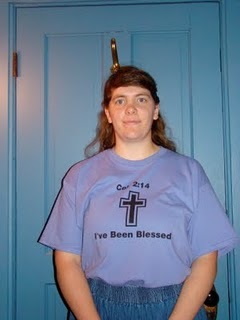 The "I've Been Blessed" shirt is one of my favorites to wear around the house or running errands. Anyways, Blue Cotton has generously offered to work with me on a giveaway as well. There are so many reasons to shop for all your custom shirt need as Blue Cotton. I love the free ground shipping, no minimum or max orders, and the super-fast service! BlueCotton custom t-shirts offers printed and embroidered t-shirts, hats, and outerwear for groups of all kinds: schools, churches, sports teams, non-profits, fraternities, sororities, or those who simply want to make a proud, personal statement. All orders qualify for free ground shipping which will ship via UPS or USPS from Bowling Green, KY within 10 business days of the day you place your order. If you are in a hurry then you can take advantage of our rush order upgrades. We offer a 5 day rush order upgrade which is guaranteed to be delivered 1 week from the day you place your order. We also have a "Super Rush" upgrade which guarantees delivery in 3 business days (certain restrictions apply). We also offer our "Shirts in a Day" upgrade. The "Shirts in a Day" upgrade allows you to receive your shirts in 1 business day!!! Place your order before 12:00 noon, CST and you will receive your shirts the next business day(certain restrictions apply). Try BlueCotton for your next event!" One of my readers will receive a $100.00 gift code to Blue Cotton!! Sign up for the Blue Cotton news/updates email!! (Right side of homepage). *3 entries*- Design a shirt or other item on the Blue Cotton design studio, and share it on your FB or Twitter page! (Simply click the "Share this Design" button). 1 entry-Follow Blue Cotton on Twitter! 1 entry-"Like" Blue Cotton on Facebook! This giveaway ends Monday, October 3, 2011, at 11:59 p.m. Please leave a valid email address in each comment, as this is how the winner will be notified. Winner will have 48 hours to respond, or another winner will be chosen. Giveaway open to US residents only. Commented on post about how you get paid to blog! Commented on online education post. I do like the rafflecopter, makes it faster to enter, although it does take awhile to load on the computer. I signed up for the news/update emails. I signed up for their newsletter. Please enter me in this great giveaway! Thanks so much!! Liked Blue Cotton on FB. I entered the Business Cards 24 giveaway as well. I entered the Pediped Shoes giveaway as well. Also entered the GLO Shirt giveaway. And I entered the Sunglass Warehouse giveaway too.